Olivier Clément: "Trust will have the last word"
August 2012 : "Looking by ourselves and sharing"
Lets go and see ak benn! Voluntary drains clean-up in Grand-Yoff! Brothers from Taizé have been living in Bangladesh for many years. They have started small schools for children of very poor Muslim, Hindu and Christian families. Everyone who receives a stipend is asked to do something for others. While some become teachers in primary schools, others help coaching children on a daily basis, work with disabled people or do some other kind of service. These students are Muslims, Christians and Hindus, men and women from at least five different ethnic groups. Working together, they learn to know each other and become friends. Each year, they all participate in a Christian prayer service, a Muslim iftar (breaking of the fast during the Ramadan) and the puja (celebration) of Saraswati, the Hindu goddess of learning. These young men and women give a lot of their time to run the schools, they have earned the respect of older and qualified teachers in nearby High Schools. Serving the poor together encourages a sense of being one human family. In the monthly meetings, the teachers are encouraged to develop an inner attitude of justice, peace and love for the poor, and respect for each others’ religion and culture. This is a vital part of development. “Learning for life” is the kind of learning that is not only concerned with what can be taught from books, but also takes into account what we learn from each other, from people who have little or no academic qualification, from poets and artists and from testing one’s own artistic gifts and developing generosity. In these schools teachers and pupils alike are learners. In “learning for life”, it is important to balance a healthy desire for achievement with respect for the weak and compassion for all. “Learning for life” also means learning to know oneself a little better, by open discussions, analysis and recognition of feelings and fears. 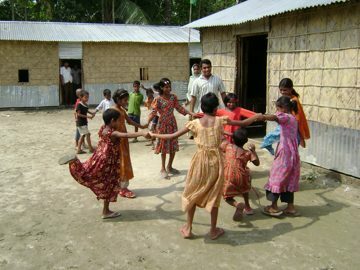 “Learning for life” is difficult, but not impossible to combine with the examination-centred style of teaching that dominates in Bangladesh. The teachers learn how to put together a lesson plan, follow a syllabus and run regular classes; how to interact with parents and fellow teachers, keep track of the development of the children in their classes and help them to advance. The children learn all the usual subjects according to the books issued by the government. But they also have cultural classes, learn songs and drama and receive classes in Peace and Conflict Resolution. The Stipend Program Schools have been running for over twenty years, entirely funded by well-wishers and donors. In this way, the schools remain a sign of what we can do together, without demanding much in return. Year after year we have been able to keep this program going. For the 1600 children in our schools, this means a changed life. The students of the stipend program now run five schools. With five small schools and fifty teachers we cannot do very much, but we try to do what is possible with the means we have. Upon the cross, Jesus cried out in a loud voice: My God, my God, why have you forsaken me?